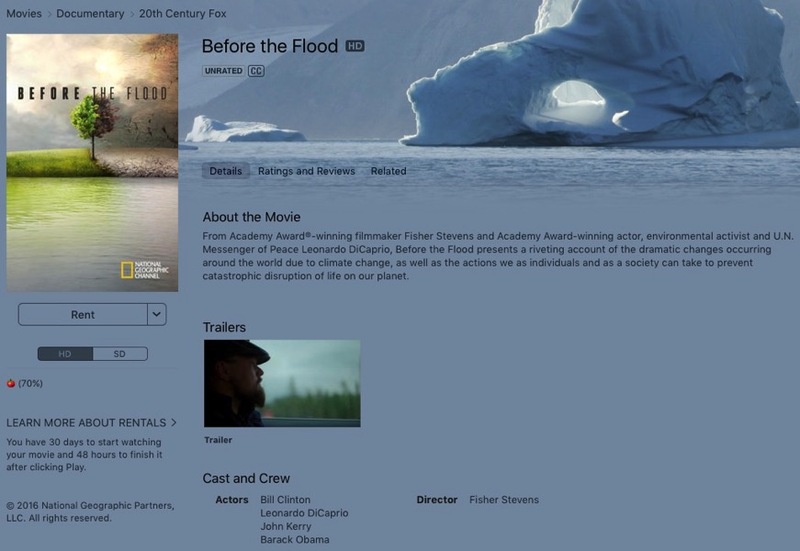 Leonardo DiCaprio’s climate change documentary, Before the Flood, produced with National Geographic, is currently available for free to view from October 31 to November 6 on a variety of platforms, which includes iTunes. Other mediums where you can find this documentary streaming for free includes: Natgeotv.com, VOD/Video On Demand (through MVPD set-top boxes), MVPD Sites and Apps, Nat Geo TV Apps (iPhone, iPad and Apple TV, Roku, Android phones, Xbox One and 360, Samsung Connected TVs), iTunes, Hulu, YouTube, Facebook, Twitter, Amazon, Sony PlayStation, GooglePlay and more. Click here to rent Before the Flood in iTunes—you’ll have 30 days to start watching it and 48 hours to finish it after clicking play.